The story takes place in Ohio, a state in the USA. It’s set in the 1970s. A time before technology overtook our lives. The main character, Lenny, lives in an apartment with her mum, Cynthia Spink, the proud, hard-working, sharp-witted, anxious mother of two and her younger brother, Davey – her happy-go-lucky brother who has gigantism. Her father, Peter Lenard Spink, has left them. He hopped on a Greyhound bus and never returned. 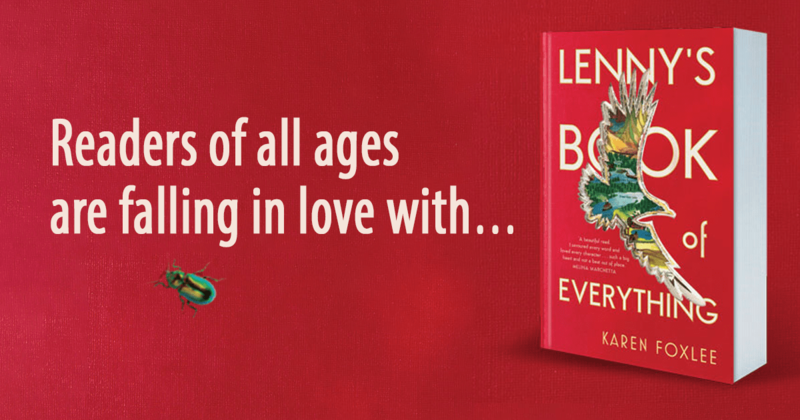 Lenny’s Book of Everything is captivating, charming and magical. Lenny, her mother and brother, live an ordinary life except for the fact that Davey grows at an alarming rate. At age six, he is four foot and ten inches or the equivalent of about 147 centimetres. So what makes this book so charming? Is it because it set in the 1970s when life was simpler? The highlight of the children’s week is the arrival of the Burrell’s Build-it-at-Home Encyclopaedia which their mother won for the children through her talented writing. Cynthia Spink’s communication with Burrell’s (through letters) is a memorable part of the book. The encyclopaedias allow the children a glimpse of the world that exists outside their apartment and their small town. They experience the wonders of the world through the books. Lenny discovers a fascination of beetles and dreams of being a coleopterist. Davey becomes enthralled with birds of prey and travelling to Great Bear Lake. I often wonder if Lenny fulfilled her dream and became a coleopterist. A lot of the charm and magic of the book lies with the characters. Every character adds an element to the story from Lenny’s best friends CJ Bartholomew and Matthew Milford to the school principal Mrs Dalrymple – keep an eye out for Mrs Dalrymple and Mrs Oliver towards the end of the book! My favourite character was Mrs Gaspar. The odd old Hungarian woman who lives in their apartment block and who looks after the children when Cynthia works. Every child should experience a Mrs Gaspar when growing up – she’s so beautifully disagreeable. “The abominable snowman,” said Davey.